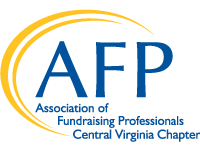 The Central Virginia chapter of AFP advances philanthropy by enabling people to practice effective and ethical fundraising. The service area covers Fredericksburg south to the North Carolina line and from Charlottesville to Williamsburg. Most events are held in the Richmond area. Click here for the top 10 reasons to join AFP! National and local membership dues are a combined $285 a year. Young professionals 30 years old or younger and retirees receive discounted membership fees.